The Canon 24mm ƒ/2.8 IS USM was introduced in February of 2012 as a long-overdue update to the twenty-plus year old Canon 24mm ƒ/2.8. The lens features a completely new design and modern features. The EF-series lens was designed to fit full-frame camera bodies, but will also work on APS-H and APS-C Canon camera bodies; on an APS-H sensor the lens will function like a 31mm lens; on an APS-C sensor, the lens functions like a 38mm lens. The lens ships with front and rear caps, but the EW-65B lens hood is optional. The lens takes 58mm filters, and is available now for approximately $850. On a sub-frame camera such as our studio Canon 7D, the lens provides excellent sharpness across its aperture settings; on a full-frame camera, the corners of the lens show a little softness. Mounted on the Canon 7D, the lens provides consistent sharpness from its widest setting of ƒ/2.8 through to ƒ/11; while it's not tack-sharp, it is very sharp indeed. Optimal sharpness, while not tack-sharp across the frame, is found at ƒ/5.6. Diffraction limiting sets in appreciably by ƒ/16, and there is a generalized softness when fully stopped-down at ƒ/22. Mounted on the full-frame Canon 1Ds mkIII, we noted a bit more of the lens' corners: specifically, there is significant softness in the extreme corners when used wide open at ƒ/2.8. However, stop down to just ƒ/4, and this corner softness reduces dramatically; at ƒ/5.6, it is negligible. You won't get tack-sharp results with this lens, but results will still be very good. Diffraction limiting again sets in at ƒ/11, and ƒ/16 produce slightly higher generalized softness. The sub-frame 7D is hit a little harder for chromatic aberration than the full-frame 1Ds mkIII, but in both cases it's fairly consistent across the range of apertures, showing up as magenta-green fringing in areas of high contrast. Happily, you won't notice it through the majority of your image, as it shows up in the corners of the image. There is a light amount of corner shading when the 24mm ƒ/2.8 IS USM is used on the sub-frame Canon 7D; the extreme corners are just 1/3 EV darker than the center. At any other aperture, corner shading is negligible. On the full-frame 1Ds mkIII, the corners are punished a bit more: used at ƒ/2.8, the extreme corners are a full stop darker than the center. This is improved as the aperture is stopped down: it's a half-stop difference at ƒ/4, and at ƒ/5.6 and smaller, it settles in at a third-of-a-stop. For a wide-angle lens, distortion is a little less distorted than you might expect: just 0.5% barrel distortion on the Canon 7D, and 0.6% on the Canon 1Ds mkIII. In both cases, you only note this distortion in the corners. Canon employs its Ultrasonic Motor for autofocus, and the results are near-silent and very quick. It took under a second to focus from close-focus to infinity. Autofocus results can be overridden at any time by simply turning the focus ring; attached 58mm filters won't rotate. 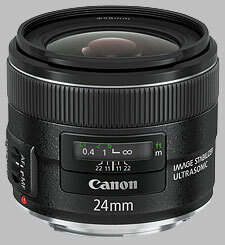 The Canon 24mm ƒ/2.8 IS USM offers passably good performance for macro work: 0.23x magnification, with a minimum close-focusing distance of 20 cm (8 inches). Canon uses a black stippled texture to finish this lens, which is light and fairly small, and mounts well to any of its camera bodies. The lens uses a new optical configuration: 11 elements in 9 groups, including aspherical elements (this is a change from the previous 24mm ƒ/2.8's 10 elements). In addition, the lens uses seven circular diaphragm blades to make up the aperture, to produce pleasing out-of-focus elements. The lens features a distance scale under a plastic window, measured in feet and meters, as well as a depth-of-field indicator (ƒ/11 and ƒ/22 marks) and an infrared index marker. Interestingly, and perhaps with an eye to the future, Canon has added image stabilization to this lens. Stabilization typically isn't added to wide-angle lenses because you can get away with a relatively low shutter speed and still get sharp images. When shooting movies however, image stabilization is useful any lens. Check out our IS Test above to see how the Canon 24mm ƒ/2.8 IS USM performed. Canon indicates that if used with the Canon 1DmkIV camera that you should update the firmware to 1.1.1 or later to optimize exposure accuracy. Canon EF 24mm ƒ/2.8 ~$? The older 24mm is now discontinued, and our test of this lens shows this is for the better: the new 24mm is sharper (especially in the corners, at ƒ/2.8), and has improved results for chromatic aberration, and corner shading. Much more expensive than the 24mm ƒ/2.8 IS USM, the 24mm ƒ/1.4 offers a faster wider aperture, but doesn't have the image stabilization of the newer lens. Used wide open, it is somewhat soft - but nothing else gets that wide and fast. Stopped down, it exceeds the sharpness of the 24mm f/2.8 IS USM at equivalent apertures. You get what you pay for. The Sigma offers a very wide aperture, but even softer corners than the Canon 24mm ƒ/2.8. Canon makes an innovative decision to include image stabilization in its wide-angle prime lenses; the lens performs well, better than the lens it is replacing, and the image stabilization will be welcomed by landscape shooters and videographers alike. From my own extensive research of the worldwide web, I fully expected this lens to be somewhat inferior to its 35mm f2 similarly image stabilised sibling, which in fairness would have been far easier to construct. But the difference is significant and whereas the 35mm lens stands out as a class apart from typical universal zoom standard, to be honest this wide-angled model does not. But it has its own merits and if the focal length is particularly important to you, perhaps for street shooting purposes, you will surely enjoy using it. It is not bitingly sharp at any aperture and for a landscape lens this is both a disadvantage and minor disappointment. 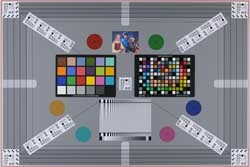 The acid test is with distant, small objects at the edges and corners of the frame. It really doesn't make a great amount of difference what setting you choose between f4 and f8, the results are not mushy by any means, but not overly impressive either. However, it is certainly true that on the 5D mark iii at least, raw file sharpening in Lightroom improves the situation a good deal. After some trial and error, I found that settings of 45, 0.9, 30 and 6 respectively worked very well for images taken in the great outdoors. My 35mm f2 lens did not require any amplification of the default sharpening settings at all and that tells you all you need to know about the gulf in class. Autofocus with this lens is so fast it's almost unnerving, especially for the likes of me with my recent diet of Fuji XF and Olympus four-thirds lenses, wonderful though they are in other respects. I mention these manufacturers because it is only fair to point out that they have each produced fine wide-angled lenses that are in terms of colour, contrast and sharpness, at least equal and in some instances superior to this Canon prime. This might be a bitter pill for some Canon fans to swallow. The Fuji XF 14mm f2.8 lens in particular covers a wider field of view, but is superior to the Canon in every respect. Most notably in terms of sharpness from corner to corner. As a cropped sensor lens, it also exhibits far less in the way of vignetting, but that flaw on full-frame is forgivable and it can be corrected quite easily after the fact. Build quality is very good. I'm not particularly bothered whether a lens is made of metal or plastic, so long as it looks and feels as though it is built to last. The mount is of course metal and the exterior moving parts are solid and unshakable enough to appear permanent. The absence of a supplied lens hood is unforgivable in my opinion. My Chinese replica version is in the post and Canon knows full well that this is an essential accessory for any wide-angled lens. My first session in the low winter morning sun didn't produce any disasters, which suggests that work against bright light is good. But sooner or later either flare or poor contrast will become factors unless I deliberately avoid pointing my camera towards the light. 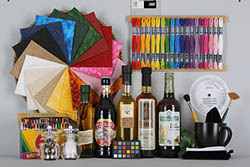 Colours from the lens are typically vibrant Canon and all have a magical tendency to look warm and punchy without being artificial or over-saturated. This makes even thumbnail images look pleasing. The lens does not exhibit very much visible distortion, which is helpful because even with camera profiles, the process of correcting it can often cause blurriness at the edges and the less that needs to be done the better. By nature, I am a zoom rather than prime shooter. And I was a reluctant full-frame convert because I have been accustomed to lightweight equipment. I eventually opted for the Canon 5D mark iii because of its superior focus system, but only decided to buy the camera because I eventually came around to the view that I could also buy lenses that were of a convenient size and weight, without being compromised in terms of image quality. This particular lens balances well on the camera and helps justify my decision to throw my hard-earned cash in Canon's direction. In summary, the lens is a joy to use and the results from it are pleasing, if not exactly top notch. Therefore, with some slight misgivings I can recommend the lens and hope this review has been of some help to you.